Despite regulatory challenges, privacy concerns and a lack of capabilities that could stall their widespread use, drones could have a significant impact on the property/casualty industry. A recent report from IT firm Cognizant suggests that commercial and personal lines insurers that cover property risks are likely to be early adopters of drone technology. Hat tip to Claims Journal which reports on this story here. For example, a property adjuster or risk engineer could use a drone to capture details of a location or building, and obtain useful insights during claims processing or risk assessments, Cognizant says. Drones could also be deployed to enable faster and more effective resolution of claims during catastrophes. Crop insurance is another area where drones could be used — not only to determine the actual cultivatable land, but also during the claims process to understand the extent of loss and the actual yield, reducing the potential for fraudulent claims. The findings come amid recent reports that several home and auto insurers are considering the use of UAVs. The Association for Unmanned Vehicle Systems International predicts that within 10 years (2015 to 2025) drones will create approximately 100,000 new jobs and around $82 billion in economic activity, the report notes. Cognizant goes on to note that drone enhancements such as artificial intelligence, augmented reality and integrating audio, text and video already exist in some shape or form. Insurance carriers should expect to see the adoption of drones increase significantly as these features are integrated into standard drones, and as regulations for commercial use of drones are defined. Unmanned aerial vehicles (UAV), otherwise known as drones, appear to be moving closer to commercial application, and property/casualty insurers are getting involved. On the one hand, insurers are looking at ways to use this emerging technology to improve the services they provide to personal policyholders, at the same time they are assessing the potential risks of commercial drone use for the businesses they insure. The Chicago Tribune this week reported that several home and auto insurers are considering the use of UAVs, and at least one has sought permission from the Federal Aviation Administration (FAA) to research the use of drones in processing disaster claims. According to Sam Friedman, research team leader at Deloitte, drone aircraft could be the next mobile tech tool in claims management. In a post on PC360.com, Friedman says that sending a drone into a disaster area would enable insurers to deliver more timely settlements to policyholders and spare adjusters from being exposed to the hazards of inspecting catastrophe claims in disaster areas. Insurance is not the only industry eyeing commercial applications. Agriculture, real estate, oil and gas, electric utilities, freight delivery, motion pictures, to name a few are seen as major potential markets for UAVs. 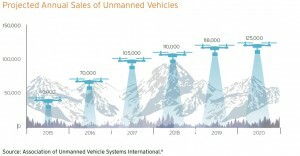 A recent report by IGI Consulting predicts that U.S. sales of UAVs could triple to $15 billion in 2020 from $5 billion in 2013. However, the broader commercial use of drones in the U.S. will depend on federal regulators developing appropriate rules. In September the Federal Aviation Administration (FAA) gave the go-ahead for six TV and movie production companies to use drones for filming. In his WillisWire post, Doyle notes that regulation is a key element to the successful widespread development of the drone industry in the U.S. given the complexities of the liability environment, the crowded skies over metropolitan areas, and the variety of UAVs and their uses. One thing’s for sure, when UAV use takes off in the U.S., insurers are ready to support this emerging technology both as risk takers and risk protectors. While itÃ¢â‚¬â„¢s too soon to know how the crash of Asiana AirlinesÃ‚ Flight 214 may affect the market for airline insurance, itÃ¢â‚¬â„¢s important to recognize that the loss comes at a time when the industryÃ¢â‚¬â„¢s overall claims level was exceptionally low, reflecting its investment in safety. In its latest Q2 2013 Airline Insurance Market News, Aon had reported on the extremely low level of claims the market had seen up to the beginning of May 2013. This followed a 40 percent reduction in the cost of major losses in 2012. For the year to the beginning of May 2013, the loss figure, excluding minor losses, was $107.63 million, which while up from the $32.17 million recorded at the same point in 2012, was still some 67 percent below the five-year average, Aon said. Adding an estimate for minor losses, the overall loss total stood at $357.63 million, compared to $282.17 million in 2012. Passenger and third party fatality levels were extremely low, with only 23 up until the beginning of May, compared to 214 on average for the same point between 1995 and 2012, Aon added. Major losses in 2012 totaled US$324 million, nearly 40 percentÃ‚ less than the US$522 million recorded in 2011. Adding an estimate for minor losses, the overall estimated incurred claims total was US$924 million, down 20 percent against the US$1.13 billion total claims in 2011. Asia Insurance Review reports that the total insurance cover on the Boeing 777 aircraft owned by Asiana Airlines that crash landed at San Francisco international airport (SFO) on Saturday stands at $2.2 billion, according to the Financial Supervisory Service. That amount includes coverage of $130 million on the aircraft hull and $3 million in crew liability coverage. Up to $2.2 billion may be paid out for facility damages and passenger casualties. Some 291 passengers and 16 crew were on board when the aircraft crashed during its approach to the airport. The crash resulted in two fatalities and more than 180 injured. Check out a summary of the incident by law firm Kreindler & Kreindler. I.I.I. facts and stats on aviation are available here. The airline insurance sector appears to have incurred more claims than premium once again in 2010, according to AonÃ¢â‚¬â„¢s January 2011 Airline Insurance Market News. But the majority of airlines continue to take steps to reduce losses, despite continued upward movement in average claims values. AonÃ¢â‚¬â„¢s preliminary estimates suggest that total claims in 2010 breached the $2 billion level for the third time in four years. The market incurred an estimated $2.1 billion in total losses in 2010, while lead premium for 2010 looks to be just above $1.9 billion. This means a significant shortfall for underwriters even before reinsurance and fixed costs. But while 2010 saw significant claims, the data is not universally negative. For example, Aon notes that some 601 airline-related fatalities occurred in 2010, compared to the long term average of 621. Aon hints at a shift to fewer but more expensive claims, noting that between 1995 and 2009 there were 67 claims on average that met the criteria for inclusion inÃ‚ its statistical analysis. Three of the last five years has seen the number of losses fall below this number, however. Check out I.I.I. facts and stats on aviation. Conditions in the airline insurance market have been getting calmer throughout 2010 and the market appears to be stabilizing, according to AonÃ¢â‚¬â„¢s Airline Insurance Market Indicators 2010/11 report. While lead hull and liability prices continue to rise, the increases are tending to be lower than exposure growth, Aon says. This means that in real terms, the cost of airline insurance is falling. Aon reports that between January and July 2010, average lead hull and liability premium rose by 7 percent, average fleet values grew 9 percent and average passenger forecasts grew by 13 percent. Nevertheless, the airline insurance market is perilously close to suffering a fourth consecutive year without return. Why? A string of major losses since May has now put the 2010 claims level well above the long term average. Aon notes that total claims so far this year excluding minor losses are $996 million, compared to a long term average of $612 million. If there are no more major losses during 2010, Aon estimates total losses for the year including minor losses will be in the region of $1.8 billion, while total lead hull and liability premium for the year will be just over $2 billion. If this is the case Aon suggests that commitment to the sector may fall in 2011 and prices could rise as a result. Check out I.I.I. aviation facts and stats. The eruption of the EyjafjallajÃƒ ¶kull volcano in Iceland has left the aviation industry reeling, but from the perspective of the insurance markets, the position is relatively clear, according to AonÃ¢â‚¬â„¢s May 2010 Airline Insurance Market News. Aon notes that successful claims against standard airline liability insurance policies due to delays as a result of the volcanic eruption in Iceland are unlikely. The main reason for this is that this is a natural event and there has not been any actual damage to aircraft or property at this stage. However, CrossÃ‚ says itÃ¢â‚¬â„¢s important to note that insurance policies vary and a firm should always ensure they study their own policy language in determining whether they are able to claim on their insurance cover. Work continues on developing BI cover to make it more relevant and bring it into the 21st century, he adds. Check out I.I.I. facts and stats on volcanoes and aviation. Investigations continue into the plane crash that killed Polish president Lech Kaczynski and some of the countryÃ¢â‚¬â„¢s top political and military personnel on Saturday. According to reports, the Tupolev 154 aircraft en route from Warsaw to Smolensk crashed as it tried to land in foggy conditions about 1.5 km from Smolensk airport in Western Russia. All 97 people on board were killed, including PolandÃ¢â‚¬â„¢s deputy foreign minister, a dozen members of Parliament, the chiefs of the army and the navy and its Central Bank governor. An April 12Ã‚ New York Times article observes that investigators examining the crash appear to be focusing on why the pilot did not heed instructions from air traffic controllers to give up trying to land in bad weather. The NYT reports: Ã¢â‚¬Å“Their inquiry may lead to an even more delicate question: whether the pilot had felt under pressure to land to make sure that the Polish delegation would not be late for a ceremony on Saturday in the Katyn forest, where more than 20,000 Polish officers and others were massacred by the Soviets during World War II.Ã¢â‚¬  A tweet from Reinsurance Magazine, linking to an article at Postonline.co.uk cites reinsurance sources noting the crash is not thought to have been insured in the LloydÃ¢â‚¬â„¢s market. Check out I.I.I. aviation facts and stats. Hull and liability premium prices in the airline insurance market are likely to continue to rise in 2010, but the rate of increase could slow as a result of the high level of capacity that is still available, according to AonÃ¢â‚¬â„¢s Airline Insurance Market Outlook 2010. Aon says there are a number of reasons why the price rises are not likely to continue at the same rate in 2010. Firstly, while average lead hull and liability premium in the airline insurance market rose by 20 percent during 2009, taking total lead hull and liability to $1.9 billion, average annual claims over 10 years came to $1.8 billion. This means the airline insurance marketÃ¢â‚¬â„¢s current level is now enough to comfortably cover claims in an ordinary year, according Aon. Still as 2009 has proved, there is always the potential that there will be an extraordinary level of claims in a given year (total estimated claims for 2009 came to $2.3 billion), but overall the hard markets have now served their purpose and prices have risen to the point they need to be to ensure that total premium and average claims are roughly in balance. Proof that the markets have reached the equilibrium point comes from the fact that some underwriters that were holding back capacity in 2008 and 2009 are now being encouraged to participate on airline insurance programs, Aon notes. New capacity is also being attracted to the sector, a fairly sure sign that prices have reached the appropriate level. Equally, while 2009 was, hopefully, an exceptional year in terms of airline claims, the fact that the actual number of losses was relatively limited should mean that a smaller number of airline underwriters will have taken a hit on their airline books of business, Aon believes. Check out I.I.I. aviation facts and stats. In a recent post we discussed how aviation losses outweighed premiums in 2009, despite a relatively safe year for the airline industry last year. With the crash of Ethiopian AirlinesÃ‚ flight 409Ã‚ early this morning into the Mediterranean Sea off LebanonÃ¢â‚¬â„¢s south coast aviation insurers appear to have been hit with their first major loss of 2010. The Boeing 737-800, en route to Addis Ababa, crashed shortly after take-off from Beirut after losing contact with airport control amid stormy weather. According to media reports, a total of 90 passengers and crew were on board, including Marla Pietton, wife of the French ambassador to Lebanon. As of yet, no survivors have been found. While it is too soon to speculate on the cause of the crash, several reports quote Lebanese President Michel Suleiman saying a terrorist attack is unlikely. Ã¢â‚¬Å“Sabotage is ruled out as of now,Ã¢â‚¬  he said. Others report on the stormy weather conditions in Lebanon at the time, including thunder, lightning and heavy rain. Global Reinsurance has a story on the crash, including some information on the insurance implications. It reports that 54 of those on board were Lebanese. Others on board were citizens ofÃ‚ various countries including Ethiopia, Britain, Canada, Russia, France, Iraq and Syria. Check out I.I.I. aviation facts and stats.